Elizabeth Warren illustrates in this book why she is viewed as such a strong crusader for the left. Her energy and optimism run fluently throughout the book. There seems to be no obstacle, no opponent she isn�t willing to take on. The basic message of Warren's book is that our country is broken � America is not working for all Americans. Warren points out her main areas of concern and how we can change them. Yes, the right has hurt us with their selfish, greed-based decisions -- but we also have to take responsibility for our own silence in the past. Warren feels and sees the anger out there. She sees this as a sign of hope. She knows we will not be silent any more, and she points our several rallies for change already having taken place since 2016 and still happening today. America has woken up and it�s just the beginning. In the interest of full disclosure, I want to say upfront that I am a big admirer of Elizabeth Warren and have been following her career for years, as a Massachusetts resident and Massachusetts voter. A brief history of Warren for those that are not familiar with her (this history is sprinkled throughout the book). She started her education at George Washington University but dropped out at 19 to get married. She later went on and earned a B.S. degree in speech pathology and audiology from the University of Houston. From there she attended Rutgers University's Newark School of Law, and received her J.D. and passed the bar exam. Warren voted Republican for many years, saying, "I was a Republican because I thought that those were the people who best supported markets.� She began to vote Democratic in 1995 because she no longer believed that to be true, but says that she has voted for both parties because she believed that neither party should dominate. Warren taught law in the 1970s, 1980s and 1990s. She became involved with public work in bankruptcy regulation and consumer protection in the mid 1990s. She was a professor of law at Harvard Law school from 1995 to 2012. She left teaching to become the U. S. Senator from Massachusetts in 2013, a position she still currently holds. She is recognized as one of the nation�s top experts on bankruptcy and the financial pressure facing middle class families today. Warren gets right into what she feels are the strengths and weaknesses in our country. An abbreviated top 5 list of each is listed here. Rex Tillerson, former CEO of ExxonMobil, now Secretary of State, who comes with the reputation of being chummy with Russian leader Putin and for his willingness to put Exxon�s profits ahead of America�s foreign policy interests. Scott Pruitt, former Attorney General for Okalahoma, now head of the EPA. Pruitt literally shut down his environmental enforcement unit in Oklahoma. Betsy DeVos, now head of the Department of Education, who came into the job with no experience with public schools and a well known advocate for allowing for-profit schools to soak up tax dollars while fighting off bipartisan efforts to raise standards for public schools. These appointed positions are just a few examples of whom and what is running our country today. Can they put their bias and favoritism aside and make decisions that are all inclusive? Warren is watching them all closely. The left counts on her being one of their best watchdogs. To stay in balance Warren also points out whom she feels the heroes are, too. They are all Americans willing to speak up, take action and demand changes for our future. Yes, her book is biased. She leans far left and makes no apologies for it, but I never feel like she would not be open to working with the right to solve problems. She knows the power of numbers and what they can accomplish. If you�re a liberal this book will enforce your views; if you�re a conservative, and open enough to consider her views, it just may help you start the conversation that is needed for change. She also knows the other side can bring well-thought-out ideas to the table also and that no one side is perfect. Elizabeth Warren is not naive by any means. She knows we are fighting for the soul of our country. She knows this is a fight we cannot afford to back down from. She knows this is a fight for every one of us who is feeling the pain of our current political climate. And she knows we can do it and that it won�t be easy. America has never been afraid of a good fight. Yes, this is Our Fight, our good fight. Elizabeth Warren�s �This is Our Fight- The Battle to Save America�s Middle Class� delves into the ongoing assault against the American middle class. The book serves as a rebuttal against the election of Donald Trump, but furthermore as a denouncement against conservative GOP policies that she argues are threatening the livelihood of millions of Americans, and withering the remnants of the middle class. Since the beginning of her time in Washington, Warren has served as a fervent progressive voice in the Senate and is committed to fighting the grueling battles in Washington on behalf of the working American. As a former Harvard Law Professor, and current Senior Senator from Massachusetts, Warren complements her experiences in the Senate with the personal experiences of ordinary Americans who have become the victim of gross economic inequality in America. Warren highlights her own experiences growing up in Oklahoma, where her family was on the verge of becoming destitute after her father�s heart attack. In Chapter 1, Warren pays homage to laws such as the minimum wage, which provided her mother, Pauline, with employment at Sears and prevented the family from losing everything they had. According to Warren, �my mother�s minimum wage job paid enough to let us cover our mortgage and keep food on the table. We didn�t need welfare or food stamps because the minimum wage set a floor that would support us without taxpayer help� (p. 26). Despite the economic struggles that Warren�s family, and so many other Americans faced decades ago, things are only getting worse for the middle class, at a time when our country is wealthier than ever. One such member of today�s American middle class is a fifty-year-old woman whom Warren refers to as �Gina.� As a college graduate with a husband and two boys, Gina�s income at Wal-Mart is what gets her family by. Just like Warren�s mother, Gina was forced to pick up a minimum wage job to get food on the table, and clothes on her family�s backs. Like millions of other Americans, Gina relies on the minimum wage law, and despite not getting enough hours, or making enough money, she�s grateful to be employed. This example is where Warren says part of the problem lies with our current unemployment rate. Granted, Americans are becoming employed again following the 2008 Great Recession, but some jobs are low-wage and with very little stability. According to Warren, �Unemployment figures also mattered more when the minimum wage kept people out of poverty. I�m happy that the GDP is up and unemployment is down� But I�m not drinking champagne. In fact, I�m hitting alarm buttons everywhere I can. Our once-solid middle class is in mortal danger� (p.23). What Warren depicts through this quote is correct, but as shown at the beginning of Chapter 1, not everybody in Washington fully understands the hardships, misfortunes, and inequalities that are threatening the survival of millions of hardworking Americans. Early in the book, Warren describes a particular Senate committee hearing she attended on the topic of minimum wage. At the time, Warren was just recently elected, but the topic of minimum wage was one she cared a great deal about. So as the hearing came to a close after hours of deliberations, it appeared obvious that the Republican committee members were determined to halt efforts that would increase the minimum wage. This included one Senior Senator from Tennessee named Lamar Alexander. What the longtime Senator nonchalantly proposed utterly astonished Warren. According to Warren, �A longtime U.S. senator stated with calm confidence that if an employer could find someone desperate enough to take a job for fifty cents an hour, then that employer should have the right to pay that wage and not a penny more� (p.10). Instead of attempting to kill what�s left of our �solid� middle class, Lamar Alexander should consider walking a mile in the shoes of Gina�s, or Warren�s mother Pauline. With their savings wiped out, jobs taken away and expenses piling up, Alexander wants to take away what little these families have left, and put it in the pockets of billionaires such as the Walton family. Whether Senator Alexander will admit it or not, the American middle class is the backbone of our economy, because average Americans invest their earnings back into the economy. What does that mean? Centrally, this means that when ordinary Americans have a stable paycheck or are just generally making more money, they will consume (and possibly over consume) things like a new television, new supplies for fixing the house, or going out to eat more often. This contrasts with the habits of the top 1% of the population who instead save their money. Senators like Lamar Alexander vouch for relieving any possible strain on wealthy Americans, because he believes in the false theory of trickle-down economics; where the wealthy redistribute their gains back into their own companies which creates higher wages for all lower-level employees. But this doesn�t work for the reason that the rich are greedy. They continue to accumulate wealth, and none of it goes back to the average joe like Gina who is struggling to make ends meet while working brutal hours at a local Wal-Mart. This type of behavior from the GOP infuriates Warren and also myself. However, the assault doesn�t end on the topic of the minimum wage. Recently, the House of Representatives passed President Trump�s tax reform plan which, according to Kimberly Amadeo of The Balance, �Trump's tax reform plan would help the wealthy more than the middle class. Once all the deductions and exemptions are factored in, the poorest fifth of the population receives a tax break of 0.5 percent to 0.2 percent� (Amadeo, 36). In addition under the new tax plan, �The Framework hurts parents of school-age children because they lose the personal exemption for each child. That means almost 10 million parents will see their taxes increase. The Framework doesn't mention the head of household filing status. But Trump's earlier plan eliminated it. That would hurt single-parent families� (Amadeo, 37). In short, the Trump/GOP tax reform plan hurts the exact constituents who elected him to office; middle-class Americans who are struggling to get by. 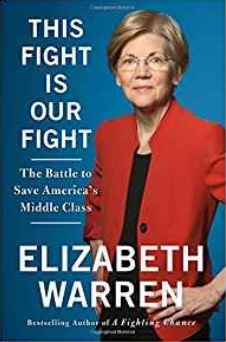 In this book, Warren advocates for a different plan when she writes, �It�s time for a hard look into how we once built a strong and vibrant middle class, how we lost our way, and how we will fight our way forward� (p.61). We need to level the playing field, and this Trump tax reform plan only tips it more in favor of himself, and the wealthy Americans he represents. Donald Trump: Campaigned for Glass-Steagall; but administration opposes it. Elizabeth Warren: Regulations built economic stability after 1930s. Elizabeth Warren: Separate consumer banking from risks on Wall Street. John McCain: Pushed GOP platform to adopt Glass-Steagall. Elizabeth Warren: Trickle-down economics overturns FDR-defined system. Elizabeth Warren: Trickle-down is a lie, and has been a lie for 37 years. Elizabeth Warren: 2008: Should have broken up bailed-out banks. Ronald Reagan: OpEd: Deregulation became a conservative mantra. Betsy DeVos: OpEd: Kids never attended public schools. Elizabeth Warren: Why should government earn $174B profit on student loans? David Koch: Funded $88M to groups that deny existence of climate change. Elizabeth Warren: BP fined $42B for 2010 explosion, then deducted it on taxes. Scott Pruitt: As OK attorney general, shut environmental enforcement unit. Rex Tillerson: OpEd: Famous for chummy ties to Russian leader Putin. Elizabeth Warren: Middle-class are angry at trade deals. Elizabeth Warren: Alternative to bad trade deals is not to shut down all trade. Elizabeth Warren: Why can corporations sue on trade deals, but workers can't? Elizabeth Warren: Electing judges is a slippery slope to judges for sale. Jerry Moran: Supported Garland nomination until challenged in primary. Newt Gingrich: Double funding for NIH research. Elizabeth Warren: Reagan military spending meant more bombs & fewer textbooks. Ronald Reagan: OpEd: Promised to shrink government, but DoD grew by 34%. Republican Party: OpEd: GOP study said "be comprehensive"; policy opposes that. Elizabeth Warren: How to advance when "flex work" requires 24/7 availability? Elizabeth Warren: Workers earning $7.25 cannot keep above poverty line. Elizabeth Warren: Republican majority could ring death knell to unions. Lamar Alexander: If I could decide, there'd be no minimum wage. David Koch: OpEd: Pressure incumbents by funding primary challengers. Elizabeth Warren: Fight back against band of billionaires, bankers, & bigots. Elizabeth Warren: Dropped out of college at age 19 to get married. Elizabeth Warren: We cannot let the American Dream die. Elizabeth Warren: Scapegoating the "other" lets rich guys run America. Elizabeth Warren: We need to fight hard, tirelessly for our core principles. Donald Trump: Cutting corporate taxes will be a great job creator. Elizabeth Warren: Reagan tax cuts reduces revenue and increase national debt. Elizabeth Warren: Demand the wealthy pay their fair share of taxes. Elizabeth Warren: Public spending on research is investing in ideas. Elizabeth Warren: China spends 8.6% of GDP on infrastructure; we spend 2.5%. Elizabeth Warren: Rental market has discrimination just like housing market.